1. Preheat oven to slow (150°C / 130°C fan-forced). Grease deep 22cm-round cake pan; line base and side with baking paper. 3. Whisk in sifted dry ingredients, then egg and extract; stir in half of the Cherry Ripe. Pour mixture into pan, top with remaining Cherry Ripe; bake about 1 3/4 hours. Stand cake 10 minutes; turn, top-side up, onto wire rack to cool. 4. Combine extra chocolate and extra butter in small saucepan; stir over low heat until smooth. Refrigerate until mixture is spreadable. 5. Meanwhile, Make Chocolate Panels: Combine chocolate and oil in medium heatproof bowl; stir over medium saucepan of simmering water until smooth. Cut two 6cm x 50cm strips of baking paper. Spread chocolate evenly over strips; lift strips to allow chocolate to drip off paper. Allow chocolate to set, then, using a ruler as a guide, cut chocolate into 4cm panels with a sharp knife. Carefully peel away baking paper. 6. Spread the chocolate mixture all over cake; place chocolate panels around side of cake. Serve with whipped cream, if desired. Tip: You can also melt the chocolate for the chocolate panels in a microwave oven; melt on medium (55%) about 1 minute, stirring twice during cooking. Stir in the oil once the chocolate has melted. Ok I made this on Saturday and couldn’t taste the Cherry Ripe in it. 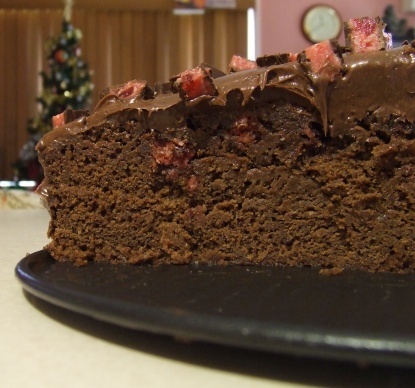 I used 5 cherry ripes – added 1 with the chocolate when melting, 1 diced and stirred into the cake, 1 diced and put on top to sink while cooking and then after it was iced I diced 2 finely and sprinkled over the top. I also used 3 eggs instead of 2. For me this was a bit rich and sickly sweet – best served with ice cream. Would be nice with a touch of rum in the cake. Looks absolutely delicious. I especially like the Cherry Ripe topping! My daughter has made this recipe several times. It usually tastes the best at least a day or two after! !